You got to love teaser trailers for other trailers. 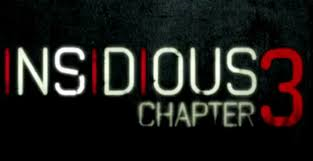 I have enjoyed the "Insidious" franchise so far. I think it is a perfect example of how to use the haunted house horror movie to wonders. I think the acting has been strong across the board. I love how it is a franchise that is not afraid to be weird and out there, and in a world where everything has to be realistic, that is somewhat of a miracle. So whatever the team behind this franchise chooses to throw at me next, I am more than ready. Telling from the teaser, this doesn't look like it will be from the perspective of Patrick Wilsons family from the first two films, it seems the ghosthunters of the franchise will be front and center this time out. Of course this was a quick teaser, and I still have no idea. It will be fun to see where this one leads. I can't wait to see the full trailer tomorrow!